I have now moved the QlikView language definition for UltraEdit to GitHub and have added a project for it on branch.qlik.com also. Unlike the language definition for Notepad++, I haven't made any changes to the UltraEdit version but am working on a couple of minor bugs so a new version should be available soon. If anyone is a regular user of the UltraEdit version and would like to help test future versions then please get in touch using the Contact Me link at the top of the page. Before the move I totted up the number of times both versions have been downloaded and am amazed at the result. A wopping 5,423 times! I'm glad there are lots of "Qlikers" out there making good use of it. Solved an issue with correct highlighting of nested function calls. Added comma "," as an operator to correct issue with function names not being highlighted correctly when it immediately follows a comma inside another function call. Added missing function tool tips. All functions should now provide both auto completion and tool tips. Removed the ability to fold IF statements because of an issue where Notepad++ tries to collapse if() functions which causes the collapsing to fail. Additionally, I have moved the project to GitHub and have added it to http://branch.qlik.com/ too. As always, head over to the Notepad++ Language Definition page (or Branch) for the download link and instructions. Yer yer I know, its about time I put together my first post about Qlik Sense. Better late than never hey. As a starting point, I thought I'd post the below video "Qlik Sense Desktop - quick build tutorial" from Qlik. It is the best "get started guide" I've found so far. It walks you step-by-step through getting Qlik Sense installed to creating your first visualisations and answering business questions. And you don't need to be a coding whiz either, not a single line of script was hurt during the making of this video. 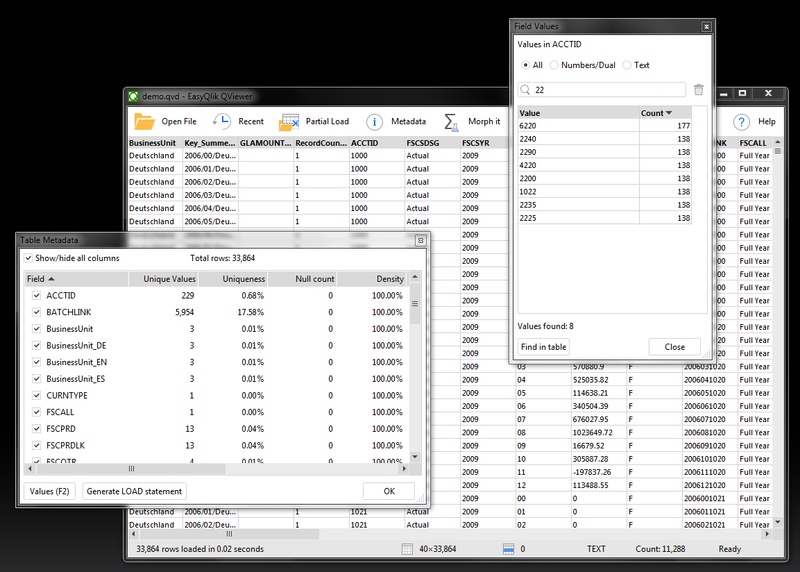 Some time ago now I reviewed QViewer, a great little tool that allows you to view the contents of a QVD without having to load it into a QlikView app. This can be a really useful thing to do when working with complex ETL solutions in QlikView. Since then it has become a firm favourite in my QlikView development toolbox. Dmitry originally created QViewer as a tool for himself, only later releasing it to other QlikView developers. Because of it's humble origins, it was never the most polished of software tools, but the fact that it has been downloaded more than 10,000 times speaks for itself. This week Dmitry has released a v2 of QViewer. As well as a new, cleaner user interface, the engine has been rewritten to give huge performance improvements. And best of all, if you already have a license for QViewer then you can download v2 for free here http://easyqlik.com/download.html.